anyone know where this comes from yet? Looks like I know which faction I'm picking. Actually the equivalent to Mysterious Egg is from the Frenzyheart Tribe faction. And that would be Disgusting Jar apparently they both have a chance of giving you something useless or one of a few pets. Also to "Monster Hunter: Freedom" fans, this looks alot like a red Tigrex when its on the ground. Both exalted faction "pet" things have a chance for same pet i think, i might be wrong. The most exciting faction reward for becoming Revered with the Oracles would have to be the Mysterious Egg. After 7 days of purchasing this item, it turns into Cracked Egg, and can contain one of the four random mini-pets listed below. Can be nice for ganking opposite factions with. Prolly works best if you have a good name and guild name though. So um, I was just looking at the View in 3-d button and to me that thing just looks like a full-sized proto-drake. Anybody else notice this? Is this an accident or is it like a normal proto-drake, just tiny? This pet occasionally makes the gurgling dancy sing noise of Murky http://www.wowhead.com/?item=20371 the Blizzcon pet. This can be confusing when someone has it out in an instance. Just got this little guy from the mysterious egg. He does do the murky gurgle song sometimes (though it seems very rare), and he also flies with you on your flying mount. It's the first pet I've seen actually fly with you and it's so cool. I just got mine and tried to use Papa Hummel's Old-Fashioned Pet Biscuit on it. It did not make the pet grow, but instead made him fly about 80 yds up. It's worth noting for people not after the pet but the green proto-drake that this is not bop once you open the egg and could be sold for massive money. I'm not sure if the green proto-drake will also be sellable but this is most likely a bug that will be fixed like the oozling thats tameable. I pet that if you get it and use it you will never get another one to sell. One thing that really makes these pets special, is that it follows your flying mount. Other pets stay on the ground, but the whelp will fly with you. Though he will fall behind and be dismissed if you have epic flying. He even breathes tiny little gusts of fire (you have to look close) the level of detail is stunning. Item doesn't say Bop, i was to excited when i got it to even check if you could mail it to an alt =/ can someone confirm this? Not BoP, just saw one @AH. No one seems to have mentioned this yet, but the whelp naturally flies at head level on a male belf (and based of images here every other race as well) most flying non-combat pets hover at waist or knee height, this one is considerably higher. Sometimes when spawned he goes to waist height, but will then jump to shoulder/head height and will stay there, after moving. I found an odd bug with this pet. Currently he has an idle vocalization which sounds exactly like the baby murloc pets (eg Murky). Was odd standing in the raid and hearing murky all of a sudden, only to realize that no one has a murky and that the sound got louder as I got closer to him. But why would you want to sell this cute little guy? Personally I just opened up my third egg, and got my second one of these, it seems obvious to me. The same is true of all the other egg pets. This pet starts to mummer/sing in a childish/chipmunkish voice at random. Had this happen twice in Dalaran today. EDIT: Additionally, the pet stops following you for that time period. Note that its completely random so dont' get disappointed if it doesnt' happen right away... just keep it out for a while and it'll happen eventually. An odd thing about this pet, not sure if it is a glitch or not but I noticed that every other pet I have can keep up with me on my mount. This one seems to fall behind. Also, since it flies with you, shouldn't it be able to keep up with you on an epic flyer? Im not sure why they let it fly with you when you're on a flyer but it eventually disappears becuase it cannot keep up. Possibly something Blizz may fix in an upcoming patch. A friend of mine just sold this for 3000g in the AH. We were both surprised. Neither of us had heard Murky's sound before, so it threw us off completely. Since having my Whelp out was the only thing I had done different recently, I see that your posts confirm my suspicion of the little guy having been the cause of the sound. Wow, the cobra hatchling makes a noise each time it flaps it's wings? I guess Proto-Drakes are too awesome to get a cute version of their whelps, not like those sissy dragons. Though even without the exaggerated baby features of the dragon whelps, this guy is still pretty cute. Also props to the brave gorloc that snuck into the proto-drake nest and got this bad-boy. I wonder why this proto-drake is baby sized and yet you also seem to be able to get a fully-grown green drake out of the egg, curious. It's a baby. It's not big enough to be epic. Yet. got this today from my second egg. and yes he is cute :) love the sounds but I was also confused when I first heard it (not from my pet but in a raid before I got him) One of my gild mates had the tickbird and he does it as well. Too bad there isnt a / command so he can do the little murky sounds lol. kinda like with Mojo. I just got this today! =D First egg too! Posted this item on the AH just before peak evening hours for 500g BO. It sold in under a minute; highly recommended that sellers list pet features such as the fire breath and sounds. just reporting that I got this guy on my third egg yesterday. it was a nice surprise. other than this, I've just got yolk so far. Many peoples think that this pet looks damn cool. This pet could be sold for 2k gold on AH on any server. You can always try as i did tell all in trade channel "Im talking to all Pet-collectors! Im selling this little baby right now <Proto Whelp link>! Just whisper me and we talk about the price!" Got it sold for 5k gold. Just an Interesting little note...If you're a Thaddius tank, this pet will follow you from platform to platform on Feugen and Stalagg during tank throws, actually flying across the gap...thought this was pretty cool. Got this twice out of 4 eggs now, Sent the 2nd one to my alt. All i need now is the big version! Today i got one on my first egg and sent it to my lvl 18 priest alt, just for fun. Not sure if it's just me, but this pet is slow... it keeps falling behind gradually, especially when i run downhill. And this just by running with old, slow, pre-lvl 30 mount (feet). What would be the most gold i could get for selling one of these? Just got my second one. Also, it shows up in no particular catagory. Consumables, do NOT select a subcatagory, and type "Hatchling" and you will find them. The first mini-pet that I love having out at most times. As already mentioned it's hovering much higher that the rest of mini-pets as well as it follows you when you're flying. Now being on RP server I'm going to roleplay taking care and feeding of this fellow while he grows up. This drake kiddy reminds me of something old..when i was kid.. Think I better stop opening my eggs the second they hatch so they can grow a bit, I got my 3rd one of these today. When I looted this the first time from my Cracked Egg and saw the picture I got so excited just until the part where you hover over and says Proto-Drake Whelp, after that its another whole week of sadness :'(. It seems that they no long make the "Murky" sounds. I was sat with mine for about 30mins today listening and he didn't make a sound. ok i kinda need help like i ned answer so to get this pet are what ever i need kill proto drakes an wait about a week till i hatch it? If you use Papa Hummel's Old-Fashioned Pet Biscuit on this guy he will not only be able to keep up with you while you are on your Epic flying mount, but even be able to keep up with you if you have a 310 mount! I have tested this and it works with both 310 swift flight form as well as the Rusted-Proto Drake. Very cool to have a little Proto Drake following you around while you fly from quest to quest, makes dailies a little less tedious. this is an awesome pet... wish i had it... i gotta start playing WoW again... evrything is happening! I remember when I first got this. I quit the gorloc reputation for the frenzyheart now, but when I got him out of the egg I was sorely disappointed because I thought I'd gotten my first protodrake mount. Yay for being a healer. Just got this from a Exotic Call-to-Arms bag. Probably have run a couple hundred heroics and this is the first i've seen so pretty exciting. Seems to be rarer then some of the other pets that drop. I might be seeing things, but I swear this guy pooped/peed while flying behind me. I was flying around in Borean Tundra on my shaman, and this little guy randomly took a joy flight. He hasn't come back yet. This pet is on the Black Market Auction House right now with a 10,000g bid. Check your pet tabs! This can be 'Put In A Cage' and sold on your AH. Personally, I somehow had three of them and didn't realize they had any value. 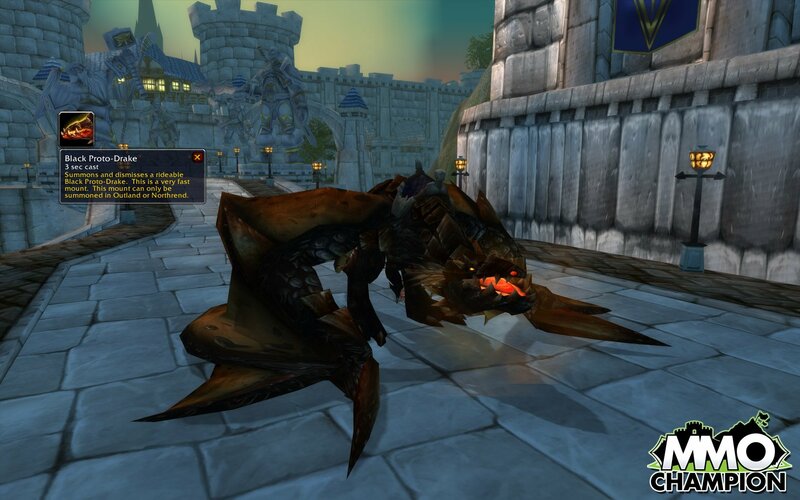 I'm very excited because dragonkin are my favorite battle pets and proto drakes are my favorite mounts. No one seems to be mentioning this... are these only Green/Uncommon? I want to know if there is a chance of getting a rare if I keep opening them, or if I should sell the extras? Can be found in an 'Amber encased treasure pouch'. Got this guy on my second egg! Just received this little guy from a Conflicto fusionado from Siege of Orgrimmar lfr.